BJP will need an alliance in AP and TN. AP if YSRCP not agreeable then with Jana Sena and TN with the AIADMK-allied group. It is because BJP is closing in on TMC very fast in WB with the collapse of INC and Left. Latest polls suggest that 7-8% vote change may turn the elections. Everyone wants to be PM because the regional leaders will need a narrative to take on Modi and BJP in their states where they are strong. Otherwise if they are not PM candidates people will ask why should I vote you. So everyone in opposition is now PM candidate. The target is to stop the Modi juggernaut. the real problem in both TN and AP is the influence of the minority child abusing thugs and their offshore controlling entities that have invested much effort and treasure in conversion and also form the spearhead waiting to thrust into India's heart. The numbers are alarmingly high and much of it is crypto so it will not be caught in any census. This is also the plan B after the loss of the LTTE and eelam migrating to the back burner. This is also the reason why the alliances in AP, as well as TN, is next to impossible. The padres have been slyly and quietly insisting on impossible conditions as well as funding and the lions share of the seats with CMs chair including vital portfolios. They want the BJP to help shoehorn them into a YSR/dramatist type of position. Incidentally, for the past four years, the BIF in India have been desperately trying to get the GoI to receive a papal visit but the GOI baulked at according the child abusers the demanded status of a state visit and the visitor to be officially received as the head of a state. The BIF were told to get him in and out on a diplomatic passport, with no official cognizance from the GoI, and no audience either from the Indian head of state or from the head of govt. Understandably, this has caused a severe bum rash and lots of burnol being ordered wholesale. SC order is our moral victory: Mamata. SC asks Kolkata top cop to appear before CBI, says can’t arrest him. Yagnasri wrote: Mamatha is impulsive in most of the time. She is also desperate. First CBI may be closing in on her and second 2019 may be her last chance to become PM and she is facing problems in both the counts. Is this kind of tantrum throwing a routine in West Bengal politics? I can understand opposition leaders trying these gimmics but an elected Chief Minister sitting on dharna that too in support of a police officer!! Overall I feel that Mumtaz Begum has been really shaken up, and she may be get more worried as the CBI would still get a chance to question the WB cadre IPS officer. She had shown similar tantrums when she heard of an Army column moving closer to the state treasury or some thing similar. This was during the De.Mo times. The dharna is from preventing the cop handing over SIT evidence collected in 2013 much before modi came into picture, which could be conveniently leaked to press leading to elections. Those who underestimate number game in vote bank politics should be alarmed by this. I wonder why mathematicians like Ramanujan have to go phoren & write books (some found after all 'lost'); while the best scientists in West make products and create patent regime. This kind of, or any kind of, factors should not be underestimated. The report states "We converted from Koch community (an ethnic Hindu). Our forefathers converted into Islam but we still speak Assamese and have never felt isolated from the Assamese society. But since we practice the same religion, we are often suspected as Muslims"[/i]. The audacity of these folks is unbelievable. rhytha wrote: The dharna is from preventing the cop handing over SIT evidence collected in 2013 much before modi came into picture, which could be conveniently leaked to press leading to elections. The cop himself seems to be hand in glove with Mutaz Begum. So don't know how cooperative he is going to be in sharing evidence. Any ways looks like the MHA is getting involved as the chap is an IPS officer. chetak wrote: This is also the plan B after the loss of the LTTE and eelam migrating to the back burner. Is'nt LTTE gang themselves a EJ sponsored terror group? The coastal areas of TN seems to have completely gone the RoP (Ramnad & adjoining districts) and RoL (Nagapattinam area) ways. Hindus make up no more than 50-60% of the population of India, at best. I've been saying this for a while now. The way it works is you convert but don't state as such on paper. This allows you to claim benefits like reservations and quotas. Some states, it's even worse. People who believe the official census figures are fools. JT, Agree with you. Hindu populatoin is definately not 75-80% as the official figures try to donate. We are way lower than that. One can make out by all the Mosques and Churches being built at a frenzy pace across India, even in corners where you would not expect ROL or ROP followers. This time invaders will not come from western front but will rise from within our own ranks. hectic negotiations and overt and covert moves going on to bring bjp, admk and pmk to an alliance. west TN would go for admk+bjp combo. 5 seats possible. dharmapuri also in play, if pmk is in alliance, Vanniyar+Gounders will make majority. south TN will have TTV Dinakaran playing spoilsport, but can get one or two with Krishnasamy's Devendra Kula Vellalar support. dmk will be favorites everywhere else. I don't know the exact situation, so TFIFW. I had seen a similar case a few years back; through the boy's sister. At least in his case what had happened was that they were a kind of broken family (the parents were actually high ranking officers, never short of money). Again because of all this no religious teachings were given to the kids (and these folks are from a Brahmin community who glorify themselves as communists). The boy lands up in hostel for his graduation and the trouble starts kicking in from then on. Looks like his room mates were EJs, and they could easily figure out that the boy was mentally weak. Don't know what happened to him and the girl also seems to be just kind have got drifted off/under the radar. What I mean to say is that such conversions generally do not happen all of a sudden. There would be root causes triggered may be years back, which was exploited by EJs who are smart in identifying the preys. Generally in most of these cases the parents abuse Hinduism are quasi atheists who have abused the Hindu right wing so the child picks up all these ideas, exposed Indian cinema where religious Hindus are villains and Padres perfect people they actually talk well of christian missionaries at home and when the EJ strike they are clueless by thee time the predatory nature is exposed. Well its touch and go, but if the parents keep thier resolve and admit thier earlier mistakes to the child, the child has a chance in a few years to come out of this spell. I have seen this happen in my extended family. There was one case that a parent passed away (his own fault, really...there's onlyso much abuse the liver can take). The X-men got her then. She even married the guy who started inducing her to take refuge in Hesoos. I have to say they are a very happy family - but the bigger picture is a poisonous one. - Let go. Tell the son he is free to convert, but don't expect any "tolerance" or any further help from parents. Cut him off instead of pandering to him. - Introspect as to why this happened. As stated above, the parents seem to be responsible for lack of values. - Adopt a child and bring him/her up with dharmic values. - Work to convert 10 people back to Hinduism. Since the time the Cambridge Analytica controversy got exposed, the Congress has been facing major embarrassment. The major expose on Congress links with the company Cambridge Analytica which is known to steal people’s private information to influence their political choice. This information was out recently after the Facebook banned the access to the company. But the other shocking part which has been exposed is that around 68 journalists, writers, bureaucrats and film stars have been hired by Cambridge Analytica company which is paying Rs 2-5 Lakhs/month to write against PM Modi. This news was discussed on Republic Tv which said that many journalists names were listed in the disclosed Emails of Cambridge Analytica. Amrish Tyagi is none other than the son of JdU leader K C Tyagi’s son. And it is found that Congress and JdU had taken the help of Cambridge Analytica during the Bihar elections during 2015. Shehzad Ponawala also disclosed certain Emails which reveals that Amrish Tyagi of Ovleno was in constant touch with both Sonia Gandhi and Rahul Gandhi since 2012. It is now clear that the Congress has hired this company called Cambridge Analytica in order to influence the voters decision on political affiliations. It is a matter of great concern that a National Party hired a foreign company to breach into the private information of millions of Indians just to win elections jeopardizing the security of people. The government announced that it will probe the matter and if any party or company was found guilty of breaching personal information of people, they will be subjected to stringent punishment. BJP not doing well in JH. They should look for an alliance. I believe BJP is trying to get in AMMK faction in alliance as well in TN. The gap in WB, JH, OR can be bridged with campaigning. So while Democrats hammer Trump for Russian interference in US elections when none existed, here BJP is hardly raising any voice against Congress for so blatantly using foreign help in Indian elections (in influencing Indian voters). Guys, I have been following the drama of Jihadi Mamta and the support to her from entire Lutyen mafia and thugbandhan. And what I find particularly troubling is the manner in which this cabal is dismissing with contempt that BJP is any less corrupt than the thugbandhan. One of the key planks of BJP is that its a different party when it comes to corruption and contrasting themselves from the thugbandhan. However, the Lutyen mafia is doing its level best to neutralize that charge which is not surprising. The one thing that I find persuasive is that while BJP/ModiJi are indeed clean, as far as the common man is concerned, he/she sees corruption in day to day life. Thus, question is that on this BJP Vs Thugbandhan slug-fest on corruption, is the voting public willing to see BJP as a clean party. that is quite a poor reading of what happened. amit shah single mindedly attacked sasi family using all tricks in the book including using governor to deny her CM ship, using strategic raids that attacked only her faction, jailed TTVD for 40 days and keeps several cases still boiling on him etc. They engineered a split in ADMK and then propped EPS and kept his govt steady. after all this, you are saying bjp is trying to get AMMK faction in alliance..that is like getting laloo mamta etc into NDA suddenly. It's actually true. While Modi and Shah and perhaps a few others are clean, most are no better than Congress. Palms have to be greased, egos have to be pandered to, and cash has to change hands. I cannot put details in a public forum, but regular interaction with them will tell you that there's no denying it. 5. Why does son of god eat meat? At independence, India suffered from widespread poverty, abysmal social indicators and rudimentary infrastructure. It then went on to adopt socialism as the centrepiece of its development strategy, with attendant features such as licence permit raj, distribution and price controls, and autarkic trade policy. The result was meagre progress for almost four decades. The process of change began gathering steam only with liberalising reforms, first introduced grudgingly in the second half of the 1980s and then deliberately from 1991 onward. But with the first four decades nearly lost, despite progress in recent decades, India’s problems have remained massive. Therefore, as a critic, if you choose to evaluate any of India’s governments according to problems that remain unsolved, you can have a field day. That is precisely the approach critics of Prime Minister Narendra Modi have taken. Such criticisms prove nothing and indeed apply with greater potency to preceding governments. Genuine evaluation requires assessing the progress made by a government against that by other governments. If this correct metric is applied, it is difficult to escape the conclusion that the present government has done splendidly well and that a return to any available alternative, which will inevitably be some variation of the erstwhile United Progressive Alliance (UPA), would set back India’s economic progress. Space constraints do not permit a comprehensive list of growth friendly policy initiatives that the present government has taken. Luckily, such detailed enumeration is not necessary either. Instead, it suffices to mention only three major reforms that the Modi government has implemented: Insolvency and Bankruptcy Code, Goods and Services Tax (GST) and Direct Benefit Transfer (DBT). If I look for reforms of matching significance during the entire 10-year rule of the predecessor UPA government, I cannot come up with a single one. Nearly all the major UPA initiatives such as MGNREGA, National Food Security Act and Right to Education Act were about social spending and contributed little to growing the economy. Its pernicious Land Acquisition Act hurt growth outright. During a public debate five years ago, a senior member of the UPA government happened to defend the record of his government by appealing to the high growth rates witnessed during its tenure. But when asked to name the reforms by his government that could be credited with this growth, he could offer no answer. As I have maintained all along, the high growth rates during UPA rule largely represented a lagged response to the reforms that Prime Ministers Narasimha Rao and Atal Bihari Vajpayee had painstakingly implemented. Exceptional performance in telecommunications, automobiles, two wheelers, civil aviation and software industries owed much of their success to those reforms. Recent debate on whether the UPA or Modi government delivered better growth outcomes has wholly missed this critical point. Indeed, not only was the first UPA government lucky enough to harvest what the Vajpayee government had sown, at the end of its second term, it also left an un-ploughed field with debris thrown all over. The successor government had to spend its entire first year removing the debris and readying the field for cultivation again by reassuring investors against retrospective taxation, taming inflation, unblocking numerous stuck infrastructure projects, and ending bureaucratic paralysis. Even so, can one argue that a new coalition of opposition parties would be different from UPA of yesteryear? Alas, so far there is no sign that any credible opposition leader, save Andhra Pradesh chief minister Chandrababu Naidu, seriously believes in economic reforms as being central to sustained rapid growth. 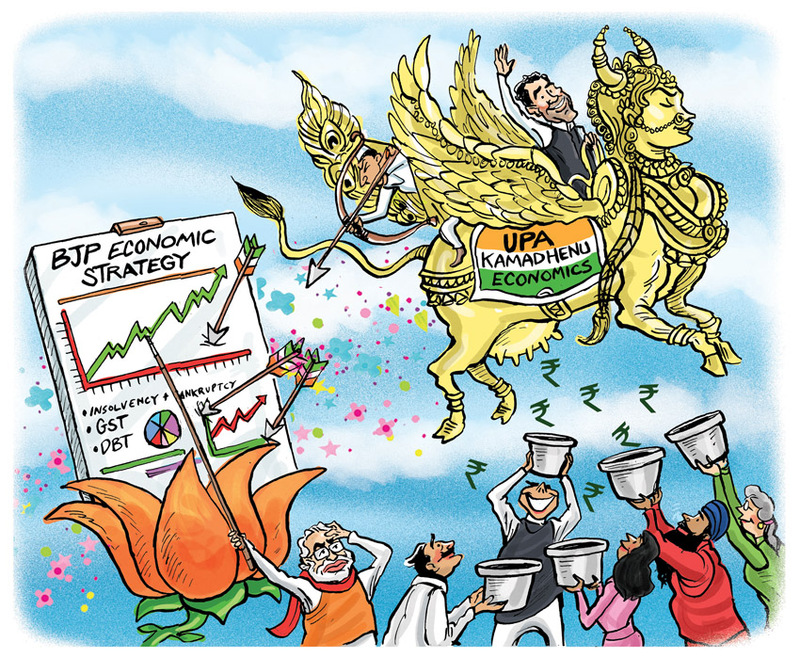 Nearly all believe that rapid growth is India’s destiny and they are there to spend the revenues the economy would keep producing aplenty like the mythical Kamadhenu. Initially, the proposal appeared to be for a universal basic income. But after several commentators pointed to its fiscal unfeasibility Praveen Chakravarty, head of Congress’s data analytics department, stated that the proposal was actually for guaranteeing a pre-specified minimum income to every citizen. It is to be implemented by giving each person the difference between the pre-specified minimum income and the income she already earns. For example, if the specified minimum income is Rs 10,000 per month and I already earn Rs 6,000, the government would give me Rs 4,000. The fatal flaw in the proposal is that if I know that I cannot find a job that pays me more than Rs 10,000, I would choose not to work at all. The optimal choice for me would be to stay on perpetual vacation and receive full Rs 10,000 from the government. Which fool would choose to work to earn Rs 6,000 that would be entirely taxed away through an equivalent cut in government bounty? Congress will need a better social spending proposal and, more importantly, a roadmap for growth friendly reforms if it wants to take the nation forward. Alas, the story of Kamadhenu is a myth, not reality!